The organism Pyrocystis fusiformis is a marine dinoflagellate. Dinoflagellates are unicellular algae capable of photosynthesis (Campbell et al. 2008). “Algae” is a general term that includes all photosynthetic eukaryotes that are not land-plants. You can think of algae as baseball players; not all baseball players live in the same place or have the same ethnicity or characteristics, but they all play baseball. All algae don’t have the same habitat or characteristics, but they all have a nucleus and photosynthesize in water. Some algae are classified as dinoflagellates, which belong to the kingdom Dinoflagellata in the major clade Alveolata, which is part of the SAR group. Members of the SAR group are grouped together because they engulfed an entire red algae plant cell and as a result they have a secondary plastid. It’s a little bit like those Russian nesting dolls that have a doll within a doll. There’s a cyanobacteria within the red algae cell within the SAR organism. In this case, the SAR organism is the dinoflagellate. This secondary plastid is the reason dinoflagellates’ chloroplasts have multiple membranes. The chloroplast is an important structure for dinoflagellates such as P. fusiformis because it is the location of photosynthesis, which is how they get their food. A unifying element of the major clade Alveolata, of which Pyrocystis fusiformis belongs, is cortical alveolae. These are cellulosic plates underneath the cell membrane that provide rigidity to the cell and offer support and protection (Delwiche 2007). As a dinoflagellate, Pyrocystis fusiformis has two flagella in at least one phase of its life cycle. One flagellum wraps around the cell in an equatorial groove called the “cingulum”, while the other flagellum is located in the cell posterior and extends from a groove called the “sulcus” (Delwiche 2007). This arrangement of flagella causes Pyrocystis fusiformis to spin as it moves through the water. Interestingly enough, this spinning or whirling motion is the reason dinoflagellates are named as they are, for dinos is Greek for “whirling” (Campbell et al. 2008). Though all dinoflagellates share these basic characteristics, each species has its own defining features. 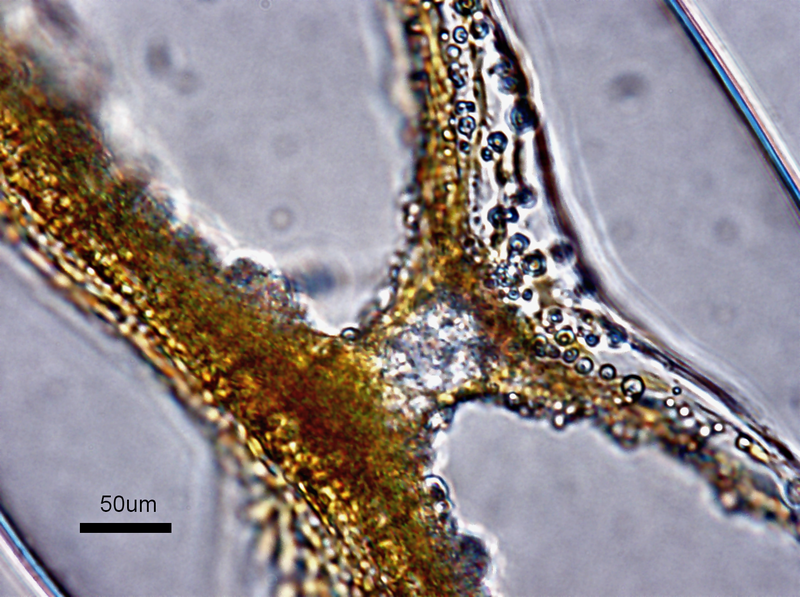 Pyrocystis fusiformis in particular is large and non-motile for the majority of its life cycle (Swift and Durbin 1972) and has a luminescent genotype (Fleisher and Case 1995). It is a major component of the marine phytoplankton community (Swift and Durbin 1972), and thus contributes a large amount of oxygen to the world’s atmosphere while also consuming a large amount of carbon dioxide (Miller 2010). Dinoflagellates respond to their environment by using different signalling pathways, depending on the signal they receive. Signals involve molecules from the environment that either can or cannot pass through the cell membrane. Different receptors include G-protein-linked receptors, which activate membrane-bound proteins, and enzyme-linked receptors, which ultimately activate enzyme activity within the cell (Burkholder and Springer 1999). Circadian rhythms directly influence multiple processes in P. fusiformis. Circadian rhythms are similar to what we think of as biological clocks. They are based on a 24-hour cycle of light and darkness, and result in changes of the physical or behavioral aspects of an organism (Fults 2011). The processes affected by circadian rhythms in P. fusiformis include photosynthesis, bioluminescence, and vertical migration (Burkholder and Springer 1999). Photosynthesis is the process of converting light to energy, using carbon dioxide as the carbon source. Bioluminescence is a reaction that results in the emission of light, and vertical migration is the movement in water depth. Bioluminescence is a defining feature of P. fusiformis. It involves the substrate luciferin reacting with oxygen and catalyzed by the enzyme luciferase (Wilson and Hastings 1998), and takes place within the scintillon organelles (Burkholder and Springer 1999). There can be as many as 400 scintillons per cell (Wilson and Hastings 1998). That’s quite a lot of bioluminescence capability for such a small organism. The end result of this reaction is a 0.1 second flash of light (Burkholder and Springer 1999) and sometimes a low intensity glow (Wilson and Hastings 1998). The maximum wavelength for this light is 474-478 nanometers (Burkholder and Springer 1999). The light may be induced by mechanical, chemical, or electrical environmental stimuli, such as change in pH. Change in pH within the scintillon is a common trigger of bioluminescence (Wilson and Hastings 1998). Factors that influence how much light is produced include cell size, nutritional status, and species (Burkholder and Springer 1999). Pyrocystis fusiformis emits this bioluminescence light at low temperatures and at temperatures exceeding 27 degrees Celsius (Burkholder and Springer 1999). 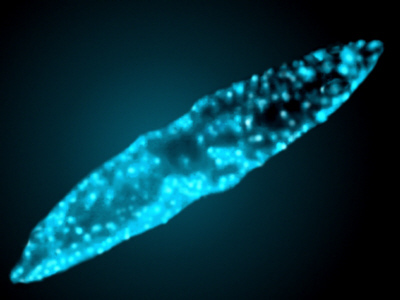 Another marine organism that performs bioluminescence is the Photeros annecohenae. For more information on bioluminescence, visit this site. Though Pyrocystis fusiformis can perform both photosynthesis and bioluminescence, it does not do them simultaneously. Instead, P. fusiformis performs photosynthesis during the day and bioluminescence at night. During the day, photosynthetic plastids are located near the cell membrane and thus P. fusiformis does photosynthesis and not bioluminescence (Miller 2010). The term for a non-luminescent cell is “photophase” (Fleisher and Case 1995). During the night, the plastids migrate toward the inside of the cell and the scintillons take their place near the cell membrane, causing P. fusiformis to bioluminesce at night (Miller 2010). The term for a luminescent cell is “scotophase” (Fleisher and Case 1995). The amount and timing of light in the environment influences the bioluminescent ability of P. fusiformis. The more time Pyrocystis fusiformis spends in darkness, the more bioluminescent it becomes (Fleisher and Case 1995). The timing of P. fusiformis’ bioluminescence depends on when it receives white light. For example, if it receives light early in the night, then bioluminescence is delayed. If light is received late in the night, however, then bioluminescence is accelerated. Bioluminescence is also affected by water temperature and availability of red and blue light (Burkholder and Springer 1999). "Oh I feel all wiggly and squiggly, I guess it is time to PHOTOSYNTHESIZE"
Want to know how Pyrocystis fusiformis reproduces? Go to Reproduction.